The world's most powerful electron microscope has just been installed at the new Canadian Centre for Electron Microscopy at McMaster University in Ontario. The $15 million (£8.8 million) Titan 80-300 Cubed microscope cluster will examine hundreds of 'everday products' at nano resolution in order to understand, manipulate and improve their efficiency. "This microscope is the equivalent of the Hubble Telescope looking at the atomic level instead of at stars and galaxies," says Gianluigi Botton, professor of Materials Science and Engineering. "We can now easily identify atoms, measure their chemical state and even probe the electrons that bind them together." 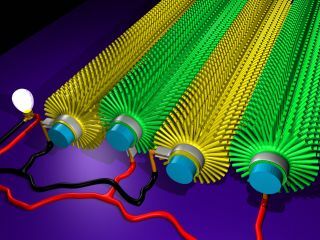 Scientists hope to use the Titan 80-300 to help produce better solar electricity cells, new delivery mechanisms for anti-cancer drugs, higher density digital memory storage, stronger automotive materials and, naturally, 'more effective cosmetics'. The microscope is housed in a stable, specially designed facility able to withstand vibrations, noise, and minute temperature fluctuations. Even someone breathing next to it could affect the results, according to nanotechnology researchers.